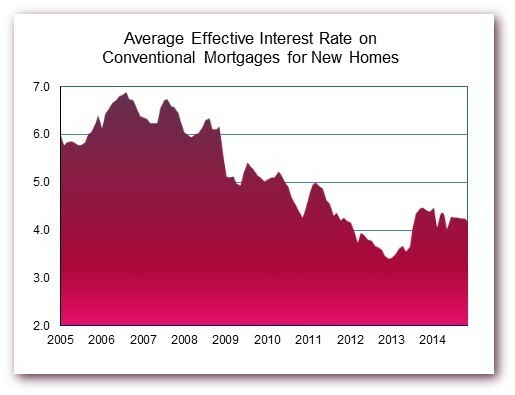 Interest rates on conventional mortgages used to buy newly built homes declined in November, based on data released earlier today by the Federal Housing Finance Agency (FHFA). The data show the average contract interest rate declining by 7 basis points to 4.03 percent, the lowest it’s been since May, while the average initial fees and charges increased by a scant two basis points to 1.23 percent. As a result, the effective interest rate (which amortizes initial fees over the estimated life of the loan) also declined by 7 basis points, to 4.16 percent—which again represents a six-month low. Meanwhile, the average size of the conventional mortgages used to purchase newly built homes increased for the third month in a row, from $324,900 in October to an all-time high of $335,300 in November (the previous record of $329,000 having been set in January). 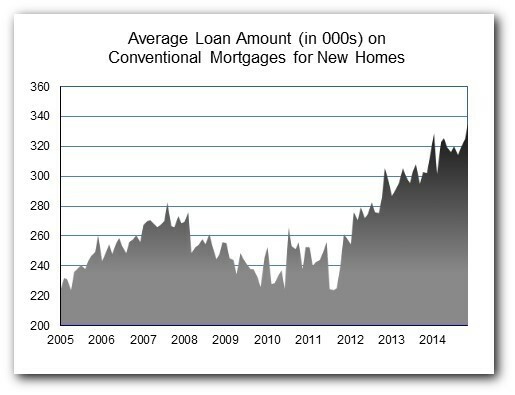 Because the loan-to-price ratio on new home mortgages hasn’t fluctuated wildly, and November’s reading of 77.9 percent was just slightly above the past year’s average, the average price of new homes purchased with conventional mortgages also reached an all-time high in November—$443,300. This information is based on FHFA’s Monthly Interest Rate Survey (MIRS) of loans closed during the last five working days in November. For other details about the survey, see the technical note at the end of FHFA’s December 30 news release.